The Alliance strikes at the heart of the Zandalari empire in the Battle of Dazar’alor, a new raid that provides both Horde and Alliance players with unique encounters for their faction—along with the opportunity to play through events from the opposite faction’s viewpoint. 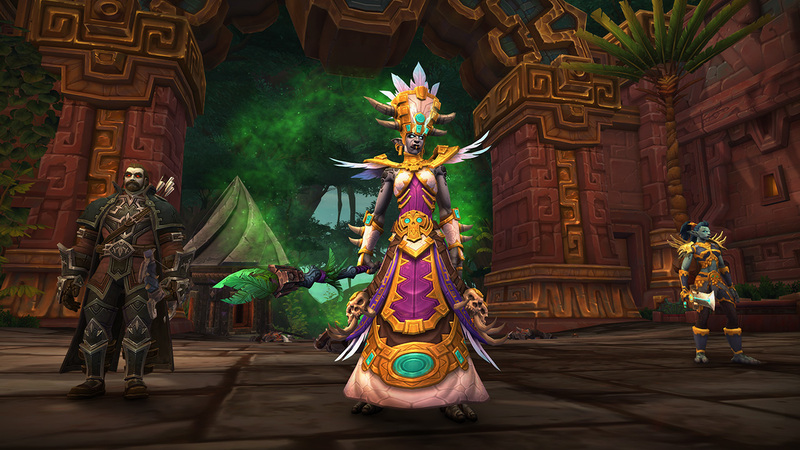 Tauren: Most tauren will turn into draenei, while draenei druids will become night elves. Then, in the final act, Victory or Death, the Horde will once again play as themselves as they attempt to push the Alliance back from the High Seat—eventually confronting several key Alliance leaders. Tidepriest Joseph and Tidepriestess Katherine are devout worshippers of the waves. These proud Kul Tirans would gladly risk their lives to ensure the safety of their compatriots. Their command over sea and storm is awesome to behold, as are the ancient and powerful rituals they practice. 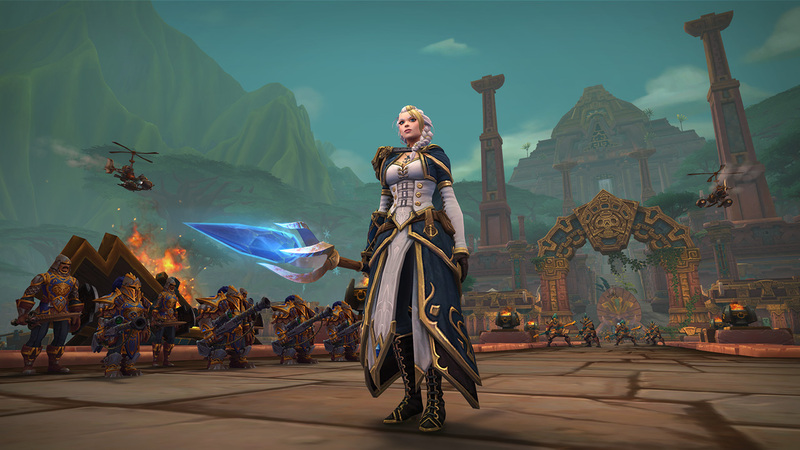 Victory or Death: Defeat the following bosses in the Battle of Dazar’alor—Mekkatorque, Stormwall Blockade, Lady Jaina Proudmoore. Snow Fun Allowed: Build a Frosty Snowmon then destroy it before defeating Jaina Proudmoore in the Battle of Dazar’alor on Normal difficulty or higher. De Lurker Be’loa: Fish up the De Lurker Be’loa, then defeat the Stormwall Blockade on Normal difficulty or higher. I Got Next! : Defeat High Tinker Mekkatorque in the Battle of Dazar’alor after defeating the Blingtron MK2 on Normal difficulty or higher. We Got Spirit, How About You? : Defeat King Rastakhan with the Phantom of Retribution, Phantom of Rage, and Phantom of Slaughter still alive on Normal Difficulty or higher. Walk the Dinosaur: Defeat the Conclave of the Chosen in the Battle of Dazar’alor without killing all the initial raptors summoned by Gonk’s Wrath on Normal difficulty or higher. Praise the Sunflower: Defeat the Opulence in the Battle of Dazar’alor after /praising a Singing Sunflower while under the effects of Brilliant Aura on Normal difficulty or higher. Hidden Dragon: Hatch the cloud serpent egg during the Jadefire Masters encounter in the Battle of Dazar’alor on Normal difficulty or higher. Barrel of Monkeys: Defeat Grong in the Battle of Dazar’alor after destroying 6 Barrels on Normal difficulty or higher. Can I Get a Hek Hek Hek Yeah? : Defeat the Champion of the Light in the Battle of Dazar’alor after stealing 3 shinies from each of the Crusaders, Disciples, and Champion of the Light on Normal difficulty or higher. Mythic: Stormwall Blockade: Defeat the Stormwall Blockade in the Battle of Dazar’alor on Mythic difficulty. Mythic: Mekkatorque: Defeat Gelbin Mekkatorque in the Battle of Dazar’alor on Mythic difficulty. Mythic: King Rastakhan: Defeat King Rastakhan in the Battle of Dazar’alor on Mythic difficulty. Mythic: Opulence: Defeat Opulence in the Battle of Dazar’alor on Mythic difficulty. Mythic: Conclave of the Chosen: Defeat Conclave of the Chosen in the Battle of Dazar’alor on Mythic difficulty. Mythic Grong: Defeat Grong in the Battle of Dazar’alor on Mythic difficulty. Mythic: Champion of the Light: Defeat the Champion of the Light in the Battle of Dazar’alor on Mythic difficulty. We look forward to taking you into the heart of the Zandalari empire when the Battle of Dazar’alor opens beginning on January 23.